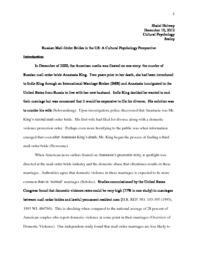 The early 21st century saw a surge in the news coverage of the murders of mail-order brides in the United States. When American news outlets fixated on these gruesome stories, a spotlight was directed at the mail-order bride industry and the domestic abuse that oftentimes results in these marriages. Authorities agree that domestic violence in these marriages is expected to be more common than in ‘normal’ marriages (Scholes). Nonetheless, mail-order marriages are less likely to end in divorce than marriages overall in the United States: divorce rates in mail-order marriages for which the courtship period lasted more than 4 months were between 35.8 and 41.3 percent when compared to the overall US divorce rate which is 48 percent (Statistics Solutions, Inc). Even more surprisingly, domestic abuse was not reported as a significant factor that contributed to divorce in mail-order marriages. In the wake of such terrible violence, many Americans asked why these women were willing to come to the United States in the first place and moreover why they seem willing to remain in abusive marriages rather than divorce. The answer to these questions is best answered by the field of cultural psychology because mail-order bride’s actions which may seem inexplicable to Americans are largely motivated by their cultural background. Thus, viewing the Russian mail-order bride phenomenon as a collision between American men’s and Russian women’s culturally-produced expectations of the marriage provides a richer understanding of why people willingly enter these marriages and additionally why domestic abuse is a frequent outcome of these arrangements. Understanding these marriages from the perspective of both the men and the women involved can help law makers institute policies that can better protect this population that is vulnerable to domestic violence.